While I admire those who do big things with big budgets, I worship those unicorns that do big things with small budgets. 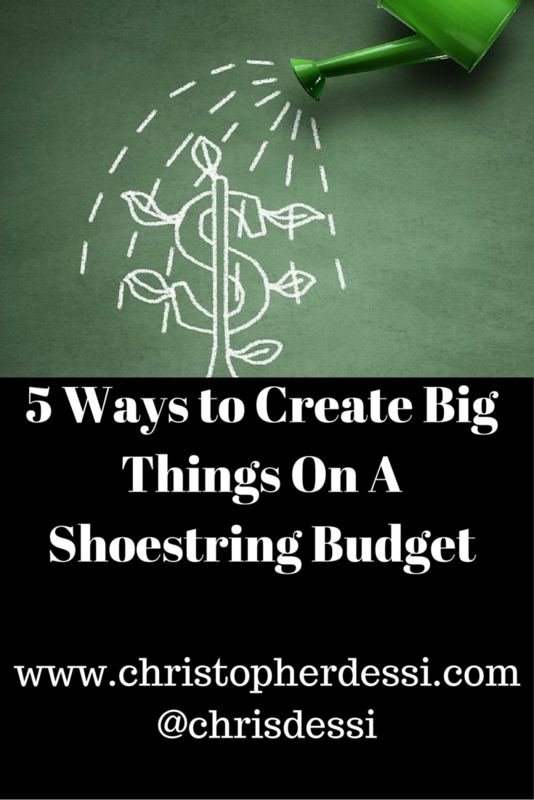 It’s no secret that money makes most things easier, but when budgets are tight creativity thrives. The lower the budget the greater the passion needed to see it through completion. TV journalist Chris Hansen has spent the better part of the past three years launching his own production company Hansen News, LLC with his own limited funding. If you’re not passionate about your project, you’ll never create anything big. Chris was so passionate about his next project that he launched a Kickstarter project to support it. Over one thousand backers pledged close to ninety thousand dollars to help Chris bring his project to life. Only the strongest among us can take dark moments in our careers, and create something big. Jeffrey Hayzlett, Primetime TV and Radio Host, and Former Fortune 100 CMO, told me how he launched his podcast with a winning mindset. “When I got the idea for my podcast, All Business with Jeffrey Hayzlett, I immediately started thinking about the best way to go about doing it,” he said.”When you start any new business, map out the best way to achieve your goal. There will be costs associated but if you have a clear plan you can decide which costs are necessary. When like-minded people who understand and admire your vision surround you, they will help you. Adrienne Garland and Laura Leites are a great example. They’re co-founders of Womancon, an annual conference for women entrepreneurs that takes place each Fall in NYC. When they started their conference series they “called every person and company we had a relationship with.” That initial support from their network was crucial. Today they say “we’re getting better and better with each passing year.” They boot-strapped the whole project with their own money. No longer do you have to go to an editor to write about your business. Now you can create a blog and publish it yourself for the world to see. No longer do you go to a radio station and say, “Please advertise my company, Mr. Radio Station Man.” Now you can simply start your own podcast. No longer do you have to go to a book publisher to print your novel or to a TV station or a movie studio to create your filmed entertainment because now there is Amazon, YouTube, Vimeo, Vine, and Instagram video. The gates have been torn down and the gatekeepers, who once were necessary to gain access, are gone. Social media has taken the power, once held tightly in the hands of the few, and dropped it right into every individual’s lap …for free. Start thinking about how you can help your network, and you’ll begin your journey to bartering for big success. If you can create value in their lives, they will exchange it for value in yours. I wanted to advertise an event I was producing on Billboards in New York City. I found InspiriaMedia. I knew they would find value in speaking at my event, so I offered them a break out session to speak and free sponsorship. Two months later I had advertisements on one of the busiest metro lines in the nation. For free. I have deep admiration for entrepreneurs and executives who create something from nothing. They have bloodied heads yet they move forward. They do. They create big things. What big things will you create? I’m also author of Remarkable You: Build a Personal Brand and Take Charge of Your Career. Here are some of my most popular articles from my column on INC Magazine.